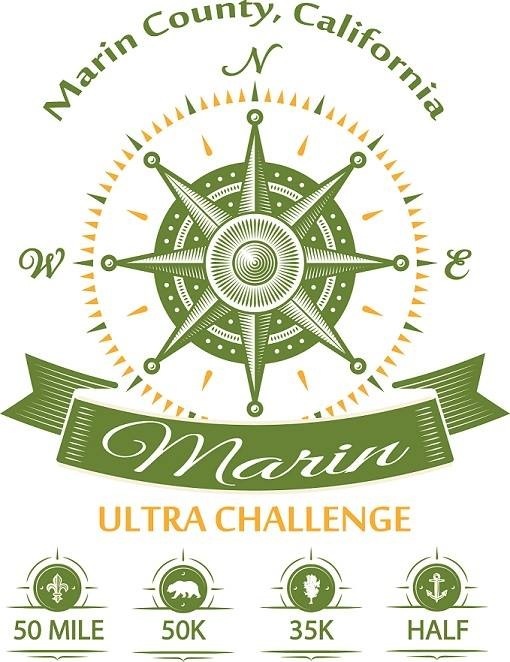 Marin Ultra Challenge is one of those events that immediately captures the imagination. In 2013 it was held in June and I sadly couldn’t make it work with my schedule. 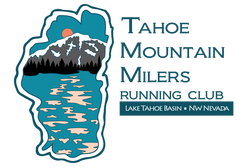 When I heard Inside Trail Racing was moving the event to March, and it was still a full four weeks out from Lake Sonoma, I just had to be a part of the action, especially since I live just 60mi up the road. A rising tide lifts all ships. In recent months, I’d experienced my best performances in the Marin Headlands, totally inspired by the efforts of my fellow ultrarunners. 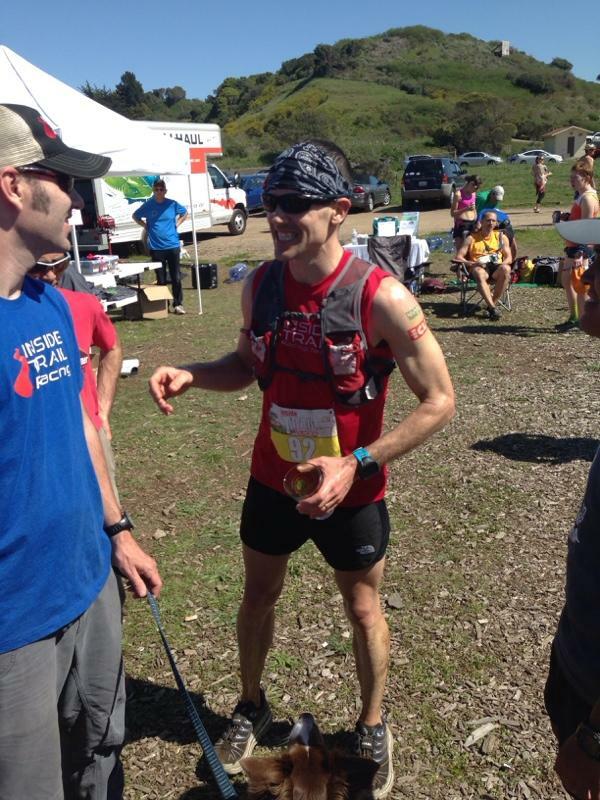 Two experiences, in particular, are Rob Krar’s brilliant performance at North Face Endurance Challenge (NFEC) in December, and Dave Mackey’s “Dirty Double”, where, within one week, he set a course-record at Quad Dipsea and immediately turned it around and ran stoic top-10 at NFEC. These masterful performances, having run along side both these guys in the early miles, pushed me to dwell deeply upon what was possible for myself at the 50mi distance, and beyond. Change the way you look at things and the things you look at change. As a teacher, an endurance sports coach, and an ultrarunner, I know that if I’m not learning I’m not growing—no challenge, no change, as they say. It’s exciting where a little curiousity will take us. 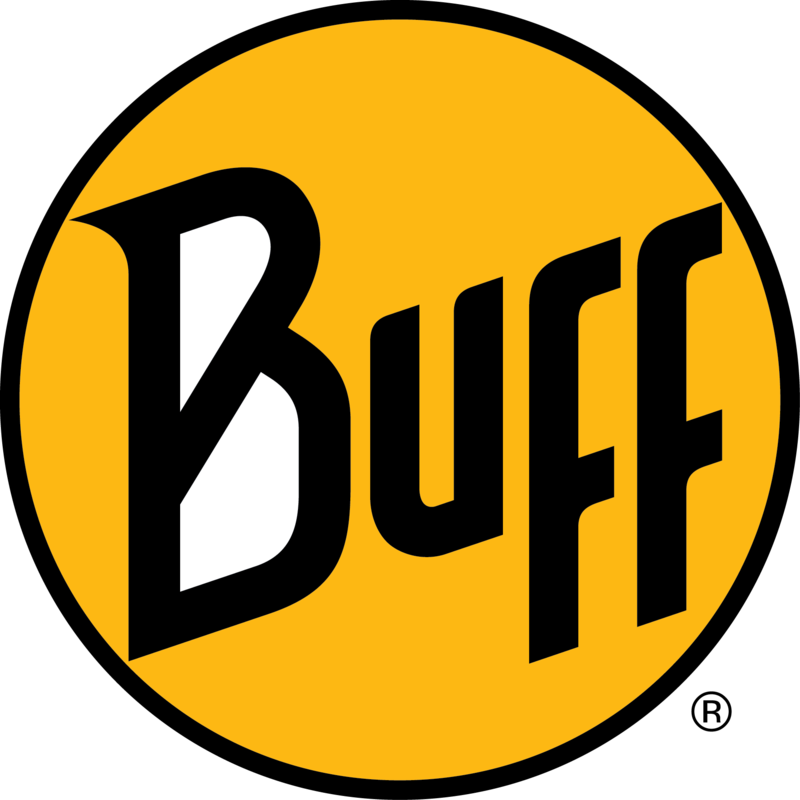 And these days, with blogs, podcasts, and the like, information on how to improve is right at our fingertips (or earbuds). Seeing guys like Krar and Mackey do what they do is awe-inspiring and quickly leads to the obvious question? How are they doing it? Well, beyond innate talent, lies a lot of hard fought experience, dedication to smart and balanced training, and a tremendous amount of passion to keep improving. Marin Ultra Challenge in March served a few key purposes: it gave me the opportunity to further dial in my 50mi race process before toeing the line at the insanely competitive Lake Sonoma 50 a month later. 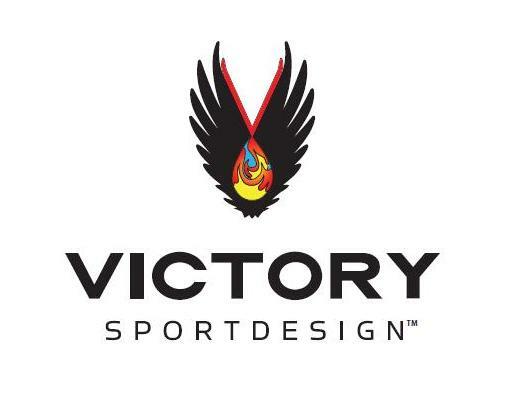 MUC in March also affords athletes the time to do a proper training build in Jan, culminating with a shorter distance race, say, three weeks out from MUC. I chose Inside Trail’s Chabot 50k, which serendipitously helped boost not only my racing endurance, but because Chabot’s a faster course—as compared to courses in the Marin Headlands—it really helped kick up my leg speed a notch or two. And these days, if you want to “rise with the tide,” you better be running fast often. Sink or swim. Fortunately for me, I don’t actually have to swim anymore. So nice. Soooo nice. 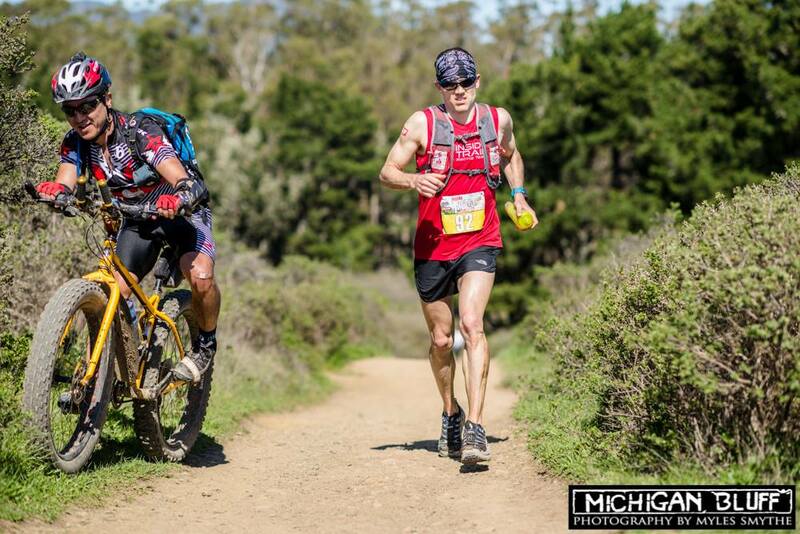 The big “test” for MUC was to add in a short, fast race just a week out from MUC, similar (but on a smaller scale) to what Mackey had done a week out from NFEC with his record-breaking Quad Dipsea. There happened to be a sweet, local 10mi trail run called the Ilsanjo Classic, just six days prior to MUC. I was more nervous for that than toeing the line at a 100-miler! I knew it was going to take me way out of my comfort zone (sink or swim). I ended up averaging a controlled 6:08/mi pace there, which I was hoping would allow me to run really quick on the downs and flats (was there any flat running?) at MUC. Since January, I’d been sprinking in more intensity than I’ve ever done as an ultrarunner—two hill sessions and a tempo run on the road. That little hour of red-line running at Ilsanjo took the wind out of my sails through the following Thursday. Uh-oh, I thought all week. I was worried but just kept listening to my body, rested, cut runs short, took a complete rest day on Thursday, and on Friday I was pleased to find I’d come out the other side ready for a strong showing in Marin, by kicking it up to 4:20 pace for a tenth of a mile on Friday’s short shake-out run. Honestly though, I could have probably used another day or two of recovery. Or, was it perfectly timed?? It was great to see Gary Gellin out supporting on race-day, and have the opportunity to chat with him since he’s had a big influence on my race execution in ultras. Nobody wants to hear it, but we do inevitably slow in the second half of these long-@$$ events. Now, by how much, that’s where Gary offered me my big “A-HA” moment last year by sorting our Lake Sonoma results and displaying for all by how much we slowed in the second half of that race. I’d raced the second half like sh*t and slowed by some 18%. Sage Canaday won, while slowing by only 12% over the second half. Then and there I’d made it a priority to always “do my math homework” coming into races, providing myself with a few “first-half/second-half pacing scenarios. Last year, the heart-rate monitor really helped me dial in a reasonable intensity over the first half of ultras so I could run stronger and slow less in the second half. It’s been challenging for me to pace effectively in the early miles of ultras, having so strongly conditioned myself to my higher intensity Ironman marathon RPE (rate perceived exertion). After ten years and some 20 Ironmans, you can imagine the re-programming I’ve had to tackle. This year though, I feel I’m finally dialed in, and my trustly heart-rate monitor’s come off. But, what a great tool to help you optimize your own ultrarunning pacing. 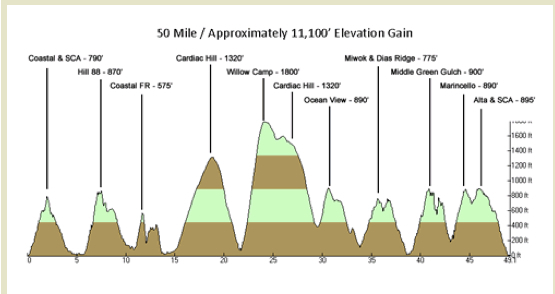 The night after Chabot 50k, I took a long look at the Marin Ultra Challenge elevation profile, and loosely established that 60% of the climbing’s in the first half. If I could summit Willow Camp and be around 7:50/mi average race pace, then I’d only have to hold around 9:30 pace to get under the existing course-record (8:45/mi pace). That would be around 10% slowing over the second half of the race. Ultimately, you can’t guarantee how things are going to pan out, but you can use previous race results to hypothesize what’s likely to occur, assuming the body’s cooperating, you stay on course, etc. 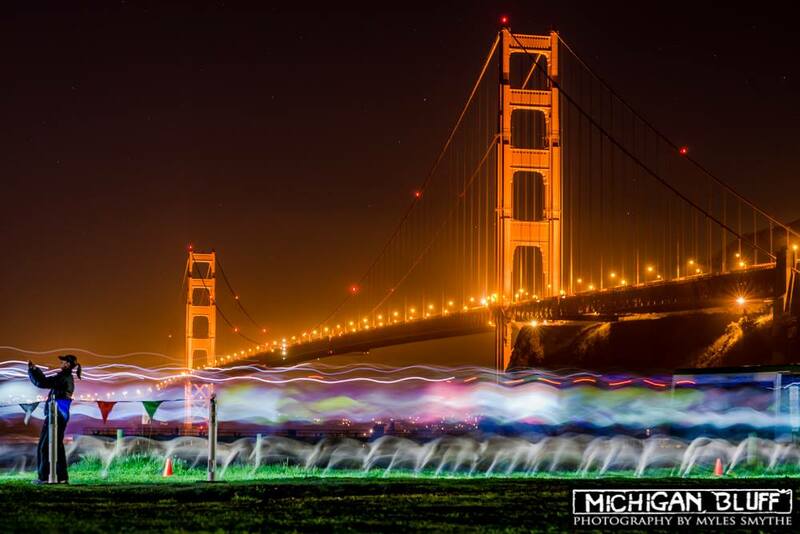 The 50mi and the 50k started together in the dark at 6am. My fully-charged Petzl NAO lit the way beautifully, up the short section of paved road to the first turn onto trail. There were two guys up, which was great, ’cause knowing my tendency to zone out in races and find myself off course, I was happy to have company navigating in the dark. But, they missed the first turn. I only made the turn because I’d done this section in another ITR event. Another runner and I yelled and got their attention, and I found myself leading, feeling great, and strangely confident I could keep myself on course ’til the sun came up. As I was dreamily bounding along, I missed a turn to stay on Coastal Trail, just passed Fort Cronkhite. Sh*t. Fortunately I caught my mistake pretty quickly and ran up to get back on the Coastal Trail heading up to the Tennessee Valley aid station. You don’t have to be off course very long for runners who aren’t navigationally challenged to put some distance into you by the time you rejoin the caravan. One runner ahead turned into two, then three, four, and five! The most important thing during a little race snafu like this is to work mindfully to accept it as soon as possible, be present, get the heart-rate down, and minimize any further “damage.” Every time your brain starts dwelling on the setback, “change the channel” to something productive, that you actually now have control over. I thought of my Hoka teammate, Michael Wardian’s, comeback and victory at the recent Coastal Challenge in Costa Rica. Note to self: that worked like a charm. Within 20min or so I’d reclaimed the lead and started moving over the course as quickly and efficiently as possilble, taking in 300cal/hr from gels, and getting in an increasing amount of water. I’d set a time vibration alarm on my Garmin for 30min, reminding me to fuel, with the intention of changing the alarm around the 50k mark, to 20min, depending on what feedback I was getting from my body. 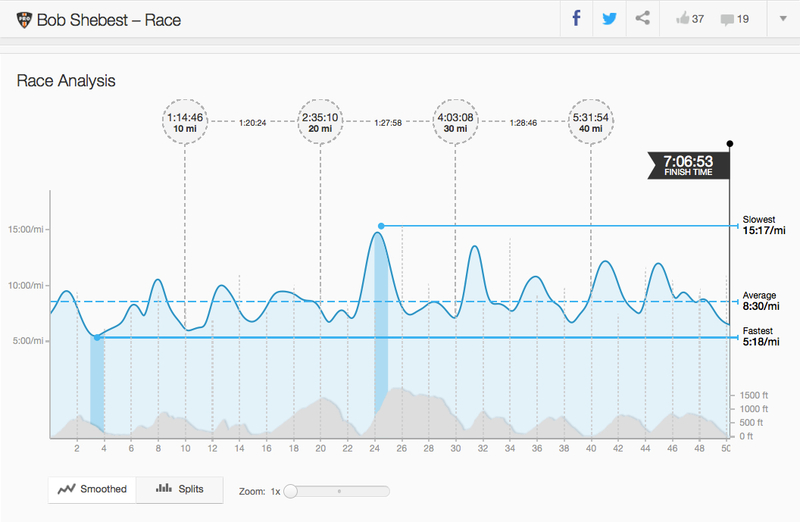 For the first half, I had two pieces of data available to me on my Garmin—race pace and race distance. I wanted to be hyper-aware of the 50mi/50k split at Heather Cutoff around mi16 and was grateful that it turned out to be so well marked. Then it was up Coast View to the Cardiac aid station and down the Dipsea to Stinson Beach for the most formidable climb of the day up Willow Camp, which I’d not had the pleasure of climbing before. Starting up Willow Camp my average pace was about 7:30/mi. I was pleased with that ’cause I knew I’d lose quite a bit on this bad boy. And by the time I summited, I was down to about a 8:06/mi average. 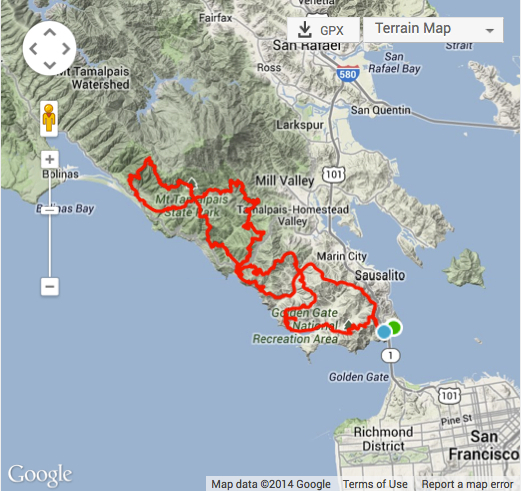 I’d stayed in control, power-hiked here, ran what I could, and enjoyed the views overlooking Stinson. With Willow Camp in the rear-view, the day was warming up. I’d had a few twinges in my right achilles earlier in the morning. I’d not had any problems with achilles this year so chalked it up to racing Ilsanjo and the fact I was running a 50-miler in the Headlands faster than I ever had before. Overall though, felt good. Chabot and Ilsanjo definitley seemed to be doing more good for me than ill.
Powered by gratitude, I cruised down Matt Davis Trail back to the Cardiac aid-station, I began dwelling on how much time/distance I’d lost being off course for a bit early on in the going. At the half, I switched over to my Garmin’s Virtual Pacer (VP), which I’d set for 8:45/mi (the existing course-record pace). I now was hovering around 10-13min ahead of my VP. That should be good, right? I finally made it to Cardiac and moved through as quickly and efficiently as I could. Two hundred yards passed Cardiac I realized I just forgot my drop-bag with the rest of my calories for the remaining 40% of the race. I had one gel left in my vest and a full bottle. Putting my metabolic efficiency to the test, I ran faster and ignored my Garmin’s vibration, telling me it was time to take calories. I was in ration mode, but relaxed and stepped on the gas, bounding down another fun section of trail. Once I got back down to Muir Beach I was ready for some calories, for sure. No gels are permitted in the Headlands, so I loaded up on CLIF SHOT BLOKS and Coke. I actually ended up really liking the BLOKS for racing, especially in the second half of a race, since you can just keep popping these little guys in and let ’em dissolve. So, disaster averted! All the way back up to Tennessee Valley, I was doing my best to prepare myself for the final, big climb up Marincello. I’ve gone up this climb numerous times during races, and it never fails to test one’s mental fortitude. Armed with a quote I recently heard in the trailer for the new movie, Unbroken, [in theaters Dec. 25th] stating, “If you can take it, you can make it,” I arrived to Tennessee Valley and vowed to myself I would not walk any part of this climb. Now I wouldn’t exactly call what I did do up Marincello, “running” per se, but I was able to use the above mountain biker as a nice carrot to keep me motivated. You take what the trail gives you. It wasn’t easy, but I kept the cadence quick, the steps short, and crested that sucker, feeling spent but excited to wrap this race up (but with the curious desire for the experience to never end). Alta and SCA trails revealed a not-too-distant yet out-of-reach national monument as I reminded myself to find my yoga breath and keep on keepin’ on. Another fellow Hoka One One athlete, in the form of Ken Michel, running the 50k, gave me some much needed encouragement as I hobbled over the final rollers before the glorious left turn that would take us back to where we started the day some seven hours before—under the majestic Golden Gate Bridge, all downhill… which sounds more delightful as I write this than it did with 49 miles and 10,000′ of cumulative quad-crushing downhill in my legs. You never know who’s going to come up from behind, ’cause it’s never over ’til its over in these ultrarunning contests. Work to that finish line. Earn every step. And then the body has your permission to completely seize up. I must’ve looked pretty bad, ’cause at the finish line volunteers actually asked if I need to be carried. Fake it ’til you make it. 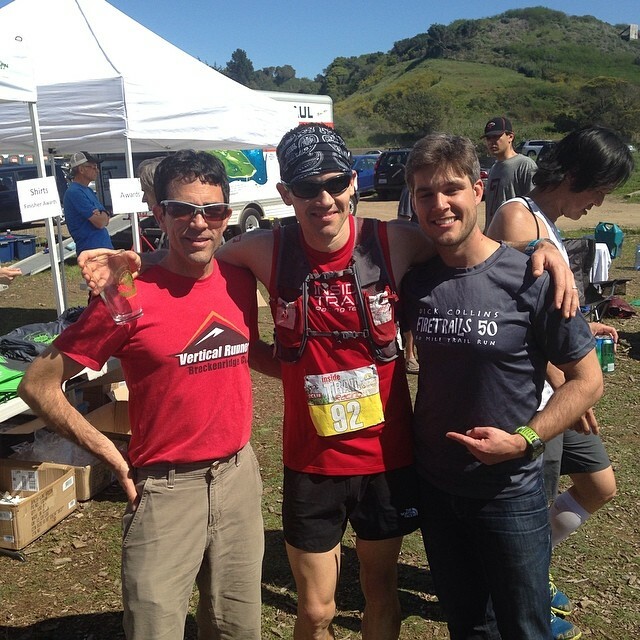 Two final things I want to highlight about the Marin Ultra Challenge were 1.) how Inside Trail Racing allowed us to deposit our head-lamps at an aid-station once the sun came up and had them waiting for us at the finish, and 2.) the big sponges in buckets full of ice-water that were offered at aid-stations once it got warm—THAT WAS SO AWESOME! There were over 70 volunteers out there making this event happen and for them I’m super grateful. With super-human race director, Mr. Tim Stahler, riding some post-race euphoria.